Get ready for grilling season with Sweet Maple Barbecue Chicken Kebabs. Pure maple syrup along with other simple ingredients create this quick and tasty meal. Do you love to grill as much as I do? I love the way grilling fills the neighborhood with sweet and savory smells of whatever I’m cooking and clean up is such a breeze. Not making a big fat mess on the kitchen stove! Get your grills ready for Sweet Maple Barbecue Chicken Skewers. This simple and delicious meal works great for dinners or any backyard gathering. You really can add any vegetables you prefer to these skewers, even baby Portabellas. Try brushing them with a thin layer of my Maple Peach Barbecue Sauce towards the end of the grilling process. Oh that would be amazing! These Sweet Maple Barbecue Chicken Skewers are easy to make and cook very quick on the grill. Giving me more time to spend with my husband and kids. I love lighting a fire in the fire pit and sipping a glass of wine while we just enjoy each others company. I’m so happy spring will be here soon and we’ll be prepping the vegetable garden! This year we’ll be planting plenty of plump, juicy tomatoes, bell peppers, and pickling cucumbers. Growing most of our own vegetables and berries in the summer makes me very happy. And I love making homemade barbecue sauce and Bread and Butter Pickles and canning them both! We have an on going joke, that if I don’t have the kitchen tool or gadget you need, you probably don’t need it! What makes your summer special? 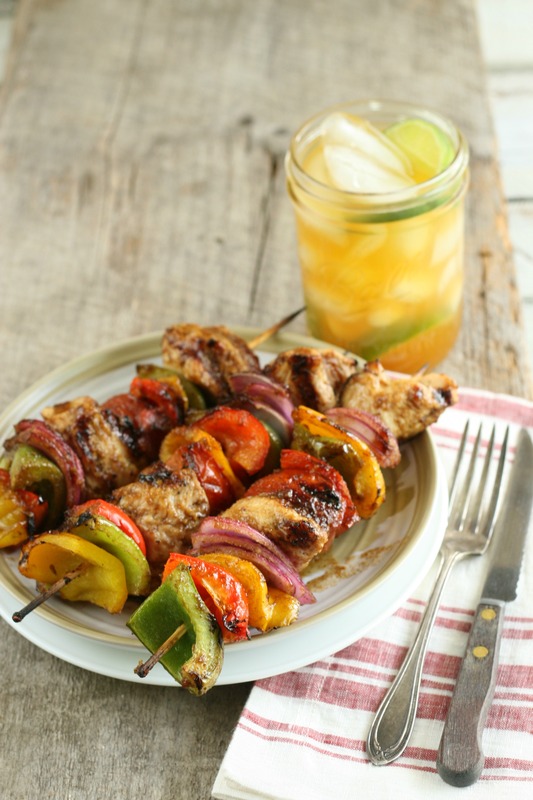 Get your outdoor grills ready for this amazing recipe! 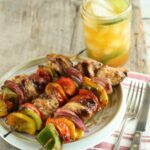 Sweet Maple Barbecue Chicken Kebabs are the perfect dinner for summer entertaining. Mix the marinate ingredients with a whisk or a spoon in a medium bowl. Set aside. Slide one piece of pepper for each color onto the wooden skewer. Followed by a piece of chicken, then a few red onion slices, followed by a piece of tomato. Then repeat until the skewer is filled up. Place into a large pan or disposable aluminum pan. Spoon over the marinate. Refrigerate for 1 hour or up to 24 hours. Grill on high, turning occasionally, until the chicken is fully cooked, about 5 minutes each side. 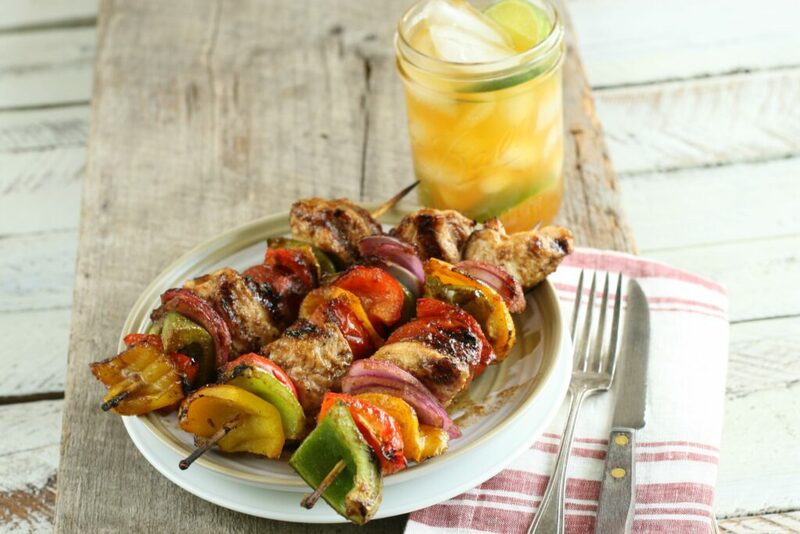 Spoon any extra marinate over the kebobs while they are on the grill. Remove from the grill, let rest for 3-4 minutes and serve.